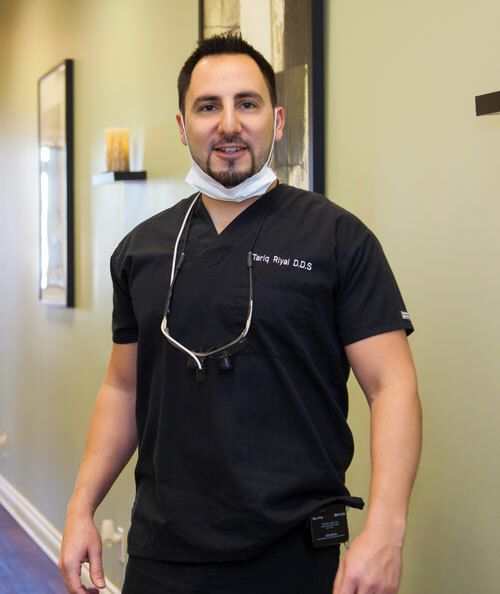 Miswak Dentistry was founded by Dr. Tariq Riyal, DDS,MPP with a dedication to providing quality dentistry to his community. Our staff is committed to making sure that you feel and look your best with every visit to Miswak so that you can be healthy and keep smiling every day. We are experienced in a variety of dental fields including Cosmetic Dentistry, Implants, and Invisalign. With our boutique, individualized approach, we are able to get to know every one of our patients and specifically tailor our treatments according to their needs, desires, concerns, and goals. Our comprehensive treatment plans will not only ensure your dental health but take your pocketbook into mind as well. We are a full-service, boutique dental office serving every single member of your family. We specialize in comfortable and effective care that will keep you healthy, smiling, and looking your best. We are dedicated to offering friendly and individualized for everyone who walks through our doors. Our specializations include Cosmetic Dentistry, Oral Surgery, Endodontics, Dental Implants, Veneers, Invisalign, Teeth Whitening, Orthodontics, Dentures, Crowns, Pediatric Care, and more. A trip to our practice can resolve most of your dental worries and usually all within one appointment so that we can get you back to where you need to be looking and feeling great! We are available at our office by phone or walk-in during regular business hours, or feel free to email us through our contact form at any time in the day. Check Out Our New Invisalign Payment Options. Click Now! Dr. Tariq Riyal is a lifelong Chicagoan with a dedication to serving the communities he grew up in. Growing up to working-class parents, his family did not have the luxury of dental insurance and struggled to find a dentist that could adequately address all of their needs. It was this childhood experience that led Dr. Riyal towards the field of dentistry with the hopes of one day being able to provide high-quality, affordable dentistry to anyone who needs it. Dr. Riyal is incredible. He's uber friendly, takes time to explain everything he's doing and answers all my questions, and I always have questions. He fitted me for Invisalign in 2013, and although I didn't get them because I had relocated out of state, he was still extremely helpful during the process. His office is clean and well kept, the decor is very nice as well. All of the staff is very friendly and I haven't had any trouble setting up appointments. I've since moved back to Chicago and I'm no longer in the area, But I still come to his office. Parking is on the street, can be annoying during winter but no problems finding a spot. Will be a loyal patient as long as I'm in Chicago! Miswak Dentistry got me an appointment right away when I chipped my tooth, and because it was small and didn't require intervention, they wrote the appointment off as a free consultation! I will surely be using them as my regular dentists from now on! I have been a patient at Miswak Dentistry for about 5 years or so. It has been the best decision I've made to finally have a permanent dentist. Everyone at the office is professional, pleasant and values your time. Thanks for taking care of me on short notice last week. And they do a great job with your teeth. Dr. Riyal got skills. He numbed me real good without me even feeling it. And I hate getting shots. The assistant showed me the filling after, and it looked realistic. The hygienist, Shauna, cleaned the heck out of my teeth. I feel ten pounds lighter and look forward to my next appointment. Everyone here was very friendly and helpful. I was shocked to learn about the annual membership program which included 2 xrays, 2 cleanings and 50% off most work. During my cleaning, I got to watch one of my favorite shows on Netflix. They also displayed my xrays digitally so I was able to zoom in and see problem areas at different levels of detail. Doctor Riyal also had a wireless camera that allowed me to see a hidden cavity on the tv screen in real time. I was very impressed and felt well informed after my visit on how I could better care for my teeth. I am going back in a month to take care of my cavity and look forward to the proper care and treatment I received. No one likes going to the dentist but here I felt comfortable and well taken care of. I thought I already had the best dentist until I came to this clinic. The best thing about them is that during your initial evaluation, they will come up with a treatment plan that shows you the whole process and cost it would take to give you that perfect smile. People are so accommodating from the receptionist, dental assistant, and the dentist. Being in the medical field, I know how important it is to have a treatment plan to follow rather than do a trial and error thing. The best part is that my x-rays were viewed on the TV while I was at the dental chair. The experience was so great I had my husband listed on their appointment. One of the best dentist visits I have ever had, the dentist took the time to sit with me and to go through my x-rays in some detail. I felt assured that the treatment I would be recommended was something that we both agreed with. A really great experience. The wait time was a bit long, but to be expected after work hours this time of year. The staff is very knowledgeable, friendly, and accommodating. They have awesome flexibility with scheduling, and pricing plans for those who need a little assistance. This is my 3rd visit with Dr Riyal; and I'll definitely be back. I had not been at the dentist for years for fear of being judged and just from being traumatized from a previous horrible experience in the care of another dentist. However, Dentist Riyal and his staff made me feel at ease from the moment I walked into the office. I was well informed about the work I would need, the cost and reassured me I was in good hands. I got a comprehensive deep cleaning and was worried about the pain the next day, but to my surprise my gums and teeth were looking good and pain free. My son (8 yrs old) and daughter (9 yrs old) also had their own check up for the first time with Dr. Riyal and they gave him and his staff ten stars. We truly appreciated the friendly, calm and professional environment at Miswak Dentistry. Highly recommended!